Are you interested in what good teaching is in the two-year college? Would you like to read about exceptional or particularly effective teaching strategies? Do you have a strategy you’d like to share with colleagues across the state? If so, inside english (i.e. 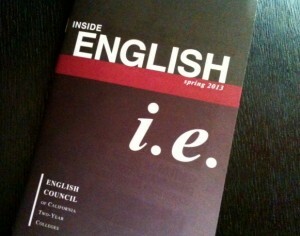 ), the journal of the English Council of California, is for you. In i.e., you’ll find articles discussing the variety of challenges that confront you daily as a community college instructor: the teaching of composition, literature, creative writing, English as a second language, and writing-across-the-disciplines. In addition, we publish shorter articles on professional development ideas and alternative classroom approaches. You’ll also read i.e.’s occasional columns — “Point of View” (philosophical or opinion pieces), “Talking Back” (responses to an article published in a recent issue), “One Good Idea” (descriptions of one teaching technique or assignment), “Part-Time Faculty Concerns,” and “Reviews” — as well as poetry and letters to the editor.